Trust me when I say before I got sick as I look back speaking to other people who suffered from chronic illness I would say “I understand”. Well let me just say for the record I was an idiot. You would think I’d know better being a retired nurse but the thing is unless you walk a mile in someone else’s shoes or at least read up on their condition and learn everything you need to be a bit more “understanding” with what you say. Most people mean well and in their defense how CAN they understand. Well, there are many ways but as I’ve found out not many want to do it. Talk to your friend and/or family member, ask them questions and learn more about the illness and your loved one.. I found this article online and wanted to share it. Please, take a few minutes out of your time to learn about those who suffer from a chronic illness. In the realm of chronic illness, one of our more challenging tasks can be gaining support from others. As if finding a knowledgeable and caring doctor wasn’t difficult enough, finding caring and supportive friends to surround ourselves with can be even more difficult. Most people are simply not capable of understanding, unless they have the misfortune of a chronic illness of their own. How many of us have heard something along the lines of “But you don’t LOOK sick…?” It makes one wonder how a sick person is “supposed” to look. If one were to hobble around on crutches, would their illness suddenly become more believable? Our society understands the visible, physical manifestations of illness, such as a broken bone in a cast or hair loss from chemotherapy. What many fail to grasp is the subtle, invisible manifestations of chronic illness. Symptoms such as pain, severe fatigue, and cognitive impairments are not easily visible to the average observer, which means that sufferers of chronic illness often look “just fine”. Our society is all about instant results – the mindset that we can just pop a magic pill and all our troubles will go away. When sufferers of a chronic illness do not quickly “get better”, we are often treated as if it were somehow our own fault. We may even be told that we are “hypochondriacs” or that “it’s all in our head”. Remember when you had the flu? You were exhausted, achy all over, and could hardly get out of bed. But, fortunately, the illness passed and you were back to your old self and usual activities. Now, imagine if you had never recovered from that flu. Every day, you wake up achingly sore and as tired as if you had not slept at all. Imagine trying to go through your usual activities while feeling this way. Not only do work, school, and regular tasks of daily living become near-impossible, but so do the smaller day-to-day things that so many take for granted, such as simply washing your hair or paying the bills. It is stressful, it is exhausting, it is depressing… and yet the chronically-ill person continues on in the face of it all. For those of you who may have, at some point, been the perpetrator of an otherwise well-intentioned comment, please understand that our illness is just as real as that of an amputee or other “visible” illness. To help aid those of you who wonder how to interact with a chronically ill person, allow me to present the Ten Commandments. 1. Thou Shalt Not Imply That We Are Not Truly Ill.
You will not convince us otherwise with remarks such as, “You LOOK good,” or “But you don’t LOOK sick.” Even if you meant them as compliments, we perceive those kind of statements as insults because they imply that you do not believe us. 2. Thou Shalt Not Imply That The Illness Can Be Easily Fixed. People with chronic illnesses are persistent, if nothing else. We hang on, day after day. We see countless doctors, take numerous medications, do endless research, and continue hoping that the answer is just around the next corner. So please do not insult us by delivering diagnoses, remedies, or comments such as, “Why don’t you just…” or “Have you tried…” or “You should….” If it truly were that simple, I assure you that we would have done it already. We are sick, not stupid. 3. Thou Shalt Not Imply That We Brought This On Ourselves. We did not choose to become ill, just as we do not choose to stay ill. Simply having a positive attitude is not going to solve our problem. One would never imply that a quadriplegic chose such a trial for themselves, or could get better “if they really wanted to”. Please afford chronically ill patients the same respect. 4. Thou Shalt Not Insult or Argue With Our Limitations or Behaviors. If people with chronic illnesses push ourselves too hard, we can suffer serious consequences. Most of us have developed coping mechanisms to help us survive, and it is cruel to expect us to do more than we are able. One chronically-ill woman I know was actually told, “I wish I could have the luxury of sleeping all day.” Believe me, we would much rather be out working, playing, spending time with loved ones, participating in normal activities. “Sleeping all day” is not a luxury for us – it is a critical necessity, one that we must take in order to protect whatever remaining health we have. Perhaps it may help to think of it in terms of being one of the medications we need to take. If you wouldn’t think of denying a diabetic their insulin, then don’t think of denying the sufferer of a chronic illness their critical need, whether it is a mid-day nap, avoidance of certain foods or environmental factors, or something else. 5. Thou Shalt Not Imply That You Can Relate To What We Are Going Through. Unless you have a chronic illness of your own, you cannot possibly understand just how much suffering is happening. Of course you want to be compassionate and want to relate to people. But when you try to do this by telling a chronically-ill person that you are always tired too, it tends to make the person feel that you are minimizing their suffering. Try saying something more along the lines of, “This must be so hard for you,” or “I can’t imagine what you’re going through.” It really does make a difference to us. 6. Thou Shalt Be Mindful Of Other Family Members. Chronic illness doesn’t just affect the person who has it, but the whole family as well. The trauma of the illness can evoke feelings of fear, depression, anger, and helplessness in all family members. The balance of family dynamics will most likely change, especially if it is a parent who is ill. The healthy spouse may end up taking on an overwhelming amount of responsibility, and even children will likely be involved in helping care for the ailing family member. Please keep these others in your thoughts as well, and make an effort to direct some special attention to them, without any mention of illness or disability. Individual family members adjust in different ways and at different paces. All members might benefit from counseling to help handle the stress involved, and each family member also needs to have time to pursue their own individual interests. External support from friends, neighbors, extended family, religious institutions, and support groups may help ease some of the burden. 7. Thou Shalt Acknowledge Our Efforts and Celebrate Even Our Small Successes With Us. For the chronically ill, any day that we can accomplish a task, no matter how small, is a “good” day! Our lives are often measured in terms of doctor’s visits and lab work, and our “success” measured by a rise in Natural Killer cell counts in our blood, or actually completing an entire load of laundry in just one day. Please do not look at us as if we are joking when we share these celebratory moments with you.Celebrate with us, be happy with us, and do not kill the moment by announcing that you just completed the Ironman Triathlon in record time. 8. Thou Shalt Offer Thy Specific Help. There are so many ways to help — the most difficult part is usually getting a chronically-ill person to accept that help. They do not want to feel like a “burden”. If you offer a vague, “Call me if I can help,” the call will probably never come. But if you are sincere, consider extending offers of specific help, such as a ride to a doctor’s appointment, or picking up a few groceries or the dry cleaning. These activities can be done in a way that does not add any extra burden to your own schedule. If you have to go to the grocery store for your own family, it really isn’t much extra work to grab an additional loaf of bread and jug of milk. If you have to swing by the post office, getting an extra roll of stamps or mailing an additional package isn’t much extra effort for you – but it can save a chronically-ill individual a lot of time, energy, and exacerbation of symptoms. 9. Thou Shalt Remember Important Events. I’m not just talking about birthdays and Christmas. A major doctor’s appointment, lab test, or new medication are all important events to the chronically-ill person. Try to sincerely ask, “How was your appointment? How did the lab test go? How’s your new medication?” The chronically-ill person will appreciate that you remembered, and that you cared enough to ask about it. 10. Thou Shalt Get To Know The Person Behind The Illness. Most of all, please remember that the chronically-ill person is more than worthy of love, friendship, and support. 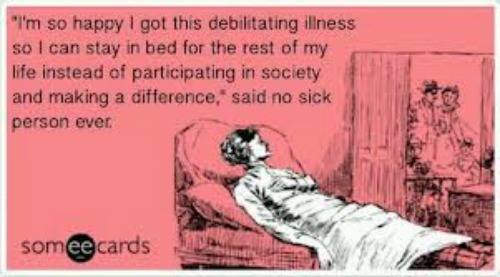 Most chronically-ill people I know are the toughest nuts I have ever met. 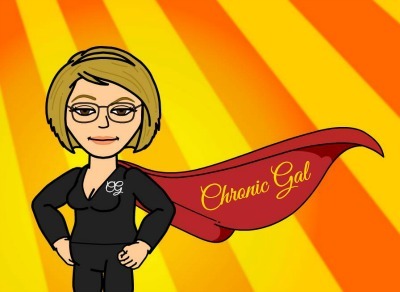 Indeed, I have come to believe that a chronic illness is not for wimps – rather, only the toughest of the tough can continually face the struggles of life while battling a debilitating disease. That kind of grit deserves nothing less than pure respect and admiration, even from our toughest critic — ourselves. I hope this gave you some insight and please feel free to share just remember to give the original author credit.